Now that the photo lab has re-opened for summer school, I was finally able to retrieve my final project and final portfolio. I had turned in on the last day of my black and white photography class and since it was (slightly) late, I wasn’t able to take it home with me right away. My final project was about food, of course. Turns out that it’s not that easy to do food in black and white! But in the end, the hard work paid off and I was satisfied with these two prints. I am so happy I decided to take the photography class last semester. Not only was it a rewarding experience learning to develop my own film and prints, but going back to the basics really helped me to understand more about digital photography. Most community colleges still offer basic black and white photography classes and I highly recommend it to anyone who is interested in photography! I love both pics but I find the first one more alluring. I love all your pictures Nicole, color or black and white! You are very talented! 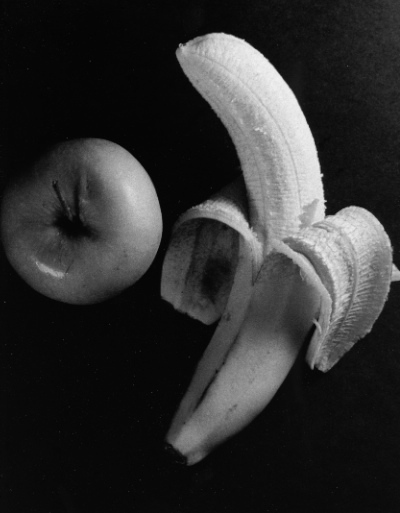 Black and white is always a challenge, but it makes you see food differently, more architecturally. These are fun. Oh you did a great job on this project! Love the B&W look you have going on. Hi Nicole How are you both pictures look simply superb. Amanda: You're totally right, food really needs to be in color! Cynthia: I agree, I like the first one the best too. I don't know if the food itself is alluring, but I think the photo is more interesting than the other. Ruby: Thanks! :-) Lydia: You're right, I really had to think more about texture where I might have depended more on color normally. Kristen: Thanks! I don't know if you'll see many more black and white food photos here, but it's definitely been fun and I hope to keep it up outside of the kitchen! Shivapriya: Thanks, it's so nice to see your comment! I hope your move went well and that you will be back to posting more of your great recipes soon! i'm so glad youre posting more!!! i absolutely love your pictures! Nice . . . very nice! I had to do a double take on the first one, as it looked like you'd snapped a pic of the breakfast I'd had this morning! Great stuff...the black and white makes the toast look extra burnt. Just how I like it. Well done! I've never tried but can imagine that doing food in black and white must be incredibly difficult. So much of the photo is about colour with food. These look good, the toast and egg is my fave. I love the breakfast shot on top. It's cinematic like an early Jim Jarmusch aerial shot in some diner at a counter. Brava! I love B&W pictures but never thought to take some at food. I love them especially the toast and egg one! Brava, Nicole! The slide show was fabulous. I did loads and loads of black and white photography before going digital. And I agree, the experience makes you a better photographer. It helps you understand light better. I believe black and white shots are much better than color for capturing mood. 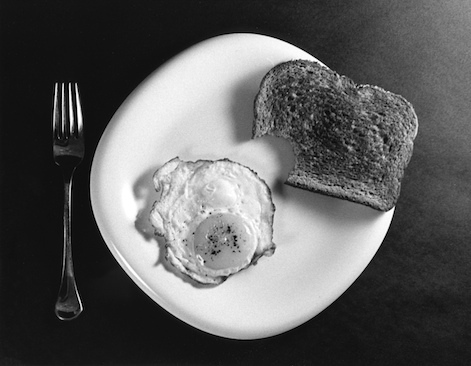 In the first shot (the egg and toast) - I'm seeing a story half-told, maybe half-written, perhaps an idea of loneliness. I think black and white and the texture playground that this medium presents enables opportunities to paint compositions that are about feelings, hopes, and desires in way that is orthogonal to the color shot of the same scene. I hope you keep on experimenting.Good luck! it was a black and white = thing.